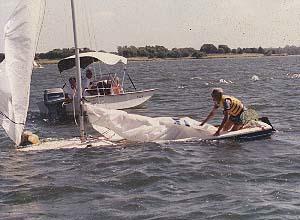 If you sail long enough and in heavy or gusty winds you will have the experience of capsizing your boat. If the boat is anything but the new Nickles Rebel you will have a difficult time righting the boat and getting the water out. Bill Blaine's account at the 1991 Nationals It was a hot and windy day, we got down early to make sure that everything was tied down in the boat, just in case. Yet, although we always anticipated that a capsize would happen to us sometime today would be our first in 15 years of sailing a Rebel. Last year several boats in the last race in Toledo submarined, capsized and turtled. That experience told us that our boat needed more flotation because other similar hulls went over and had only their stern most gunwale and a portion of the stern protruding above the water. For us it happen in the blink of an eye, we tacked, I lost the tiller, a gust of wind hit us, Tokiko slid into the boat while I tried to get out to the centerboard. Within minutes the bow filled with water and the boat was upside-down. Since this was a race, we had a rescue boat that knew what to do to help us. If you happened to be out sailing on your own you could have serious problem, either from no help available or for help that runs over your mast or lines. If the boat is on it's side it is important to get the crew out to the end of the mast to make sure that the boat does not tip any further. In the case of Bill they had the mast straight down. For this you need to put a rope on the chain plate that will be the high side when you pull the boat 90 degrees. That rope goes to the rescue boat and they pull slowly. When you get the boat to that point you should try and release the main and jib halyards so that the sails will come down as you pull the boat up the rest of the way. Depending on the amount of flotation will determine if you can bail water out then or have to be towed to the dock. Look at the amount of flotation in your boat, it should be at least 10 cubic feet--more is better. You can use an air bag, closed cell Styrofoam or 2.5 gallon water bottles. See the new page written on air bags buoyancy.htm I list a source. Make sure that you secure them well, either with strapping or you can fiberglass them in. The lower that you can add flotation the better. This will help lift the boat out of the water. If you have a pre 1800 boat consider adding 2 inches of blue foam under the wood floor. Make sure that you have the lines that you would need to aid in a rescue. The boat filled with water weighs a lot more than 700 pounds. Wear a life jacket, we had ours on. When you are in the water is no time to try and find it. This day was very warm but I know that on some days that I have sailed the time that we were in the water could cause a problem. The Rebel is a very stable boat and can handle high wind condition so if you choose to sail in 20 MPH ++ winds then make sure that your boat is equipped to handle anything that could happen.